I’m back from Chicago.Â Despite a bad cold, I had a wonderful and mostly relaxing time- ie, more family time then attractions.Â I will go to all those museums next time! Everybody, and there are crowds, is having fun as they admire and interact with this art. It is inspiration for anyone with a camera. No one can resist a self-portrait. While we were there, 2 construction workers were also looking at it.Â They proudly told us that they had worked on the assembly and pointed out where the seam lines were. While in Chicago, we toured the School of the Art Institute of Chicago.Â I was blown away by the facilities and the size of the school. The huge studio for fabric printing made me want to go back to art school.Â Our guide talked about the importance of writing for an art student.Â The students need to be able to write proposals to galleries for shows because all art is now conceptual art… huh? !Â Yeah, right.Â What a very limited definition of art… it made me sad and also reminded me of the down side of art school education. Looks like you had fun. The sculpture reminds me of one of those soft pillows. I so agree with about art school although I must admit I am envying my youngest daughter at the moment, as she is a freshman studying for her MFA at the University of North Texas. I actually went to art school in Bath UK in the late 70′s and it was the exact opposite, we weren’t taught anything about the business side of art which I, as a naive 22yr when I left, could have done with. So I think so balance has to be strived for. 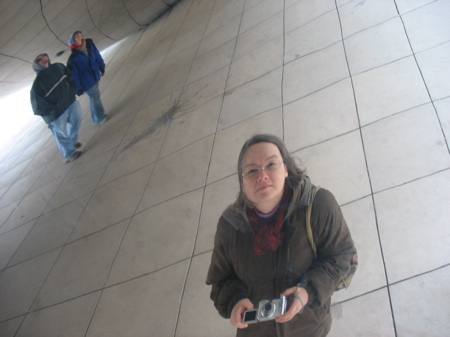 I meant to add, the Bean looks fun. I saw a program on the art channel,(can’t think of its name at the moment) which featured it as one of the art sights of Chicago. Really should get there one day. We saw a newly married couple taking wedding photos there. The only problem with it is that it’s at its best when it’s really, really clean. Dust or film diminishes the effect. Windexing it could be a full-time job for someone, like painting the Golden Gate Bridge. I, too, hate dogmaticalness. I would have thought the noun for dogmatic was dogmatism (dog-ma-tism) , but I looked dogmatic up. I think dogmatism is funner to say. :) Hey! I just noticed that Firefox wasn’t underlining dogmatism … so I looked it up and it *is* a word after all. Hooray! Back in the 60′s, my mom went to a few semesters at the Art Institute of Chicago to get an MFA, but suddenly it hit her like a bolt, “What am I doing? I want to be a teacher, not an artist!” She transfered to the University across the street, and enjoys a full rewarding career as a beloved educator. I find it amusing that even the most “creative” of our schools feel the need to define what “art” is. What is the draw of defining what we do? Isn’t it more fun to throw it out there and let it be enjoyed, rather than boxed up? My favorite kind of art is that which calls into mind my emotions and feelings, of others, the kind that makes you really think about it. As soon as you define it, it deflates like a balloon. Anyway, I can’t wait to see more Mimi, I love your artwork. Welcome back, it looks like I’ve got to get me to Chicago some time. I just downloaded your CraftyPod cast interview and will be listening to it later. I’m so excited for you having been interviewed! The Bean! 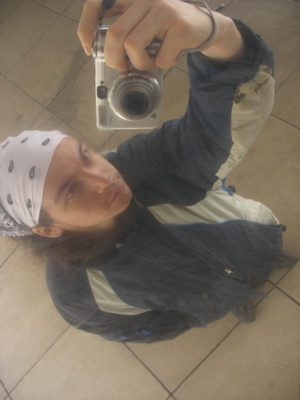 I [heart] the Bean! 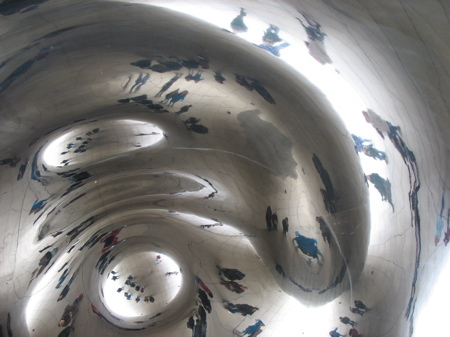 Anish Kapoor had it untitled. And he was told everyone was calling it the Bean. 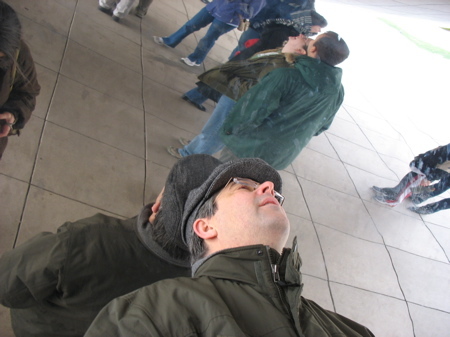 Apparently he wasn’t bothered by it, but he did give it the name Cloudgate. Did the construction workers tell you that the whole thing is suspended on two masts? So it can expand and contract with the weather! 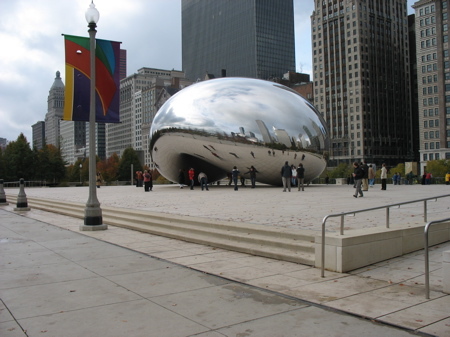 I see the Bean as an incredibly successful piece of public art. People really do interact with it and it puts them in the context of the city. I love meeting people at the Bean. I love it as a Landmark. oh funny I just discovered their collection galleries on line! Its wonderful.